The Queen of Bounce failed a series of drugs tests. Big Freedia, who pleaded guilty to theft of government funds in March, must live in a halfway house until she faces trial after breaking the terms of her bail. Billboard reports that a failed drugs test is behind the new sanctions and, in addition to living in the halfway house, The Queen Of Bounce will have to undergo frequent substance abuse tests. Big Freedia tested positive for marijuana and methamphetamines during routine drugs tests carried out between April and June. 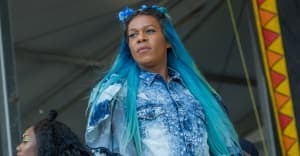 US District Judge Lance Africk has ruled that while she awaits her final sentencing, Freedia will require permission from her probation officer to leave the halfway home and upcoming concerts and live dates must be approved by the US Probation and Pretrial Services. Her final sentence will be delivered on August 11. If found guilty she could face up to 10 years in prison and a $250,000 fine.